What We Tried: Towerrunning, the sport of climbing up the stairs of skyscrapers, because, why not? Where: 4 World Trade Center, in New York City, for the first-ever Runyon Up stair climb for cancer research, benefitting the Damon Runyon Cancer Research Foundation. What We Did: I climbed to the top of 4 World Trade Center -- that's 72 floors, thank you very much. For How Long: It took me 15 minutes and 30 seconds, good enough for 112th place out of 640. The winner crossed the finish line in 8:56, and the first woman to finish did so in 11:17, according to the official results. How'd It Feel: Utterly exhausting and so fulfilling. But let me back up. I've never been so nervous before a race, and I've raced a handful. But all those other races have been almost entirely known. Whether I was toeing the line at a mile, 5K, 10K or half marathon, I had always previously run that distance or just slightly less in a training run. There's not exactly an easy way to training running up 1,632 steps. I did a really tough stair workout a couple of weeks before the race and kept up with my general workout routine, but I felt completely lost going into this adventure: What should my pace be? How much was this going to hurt? 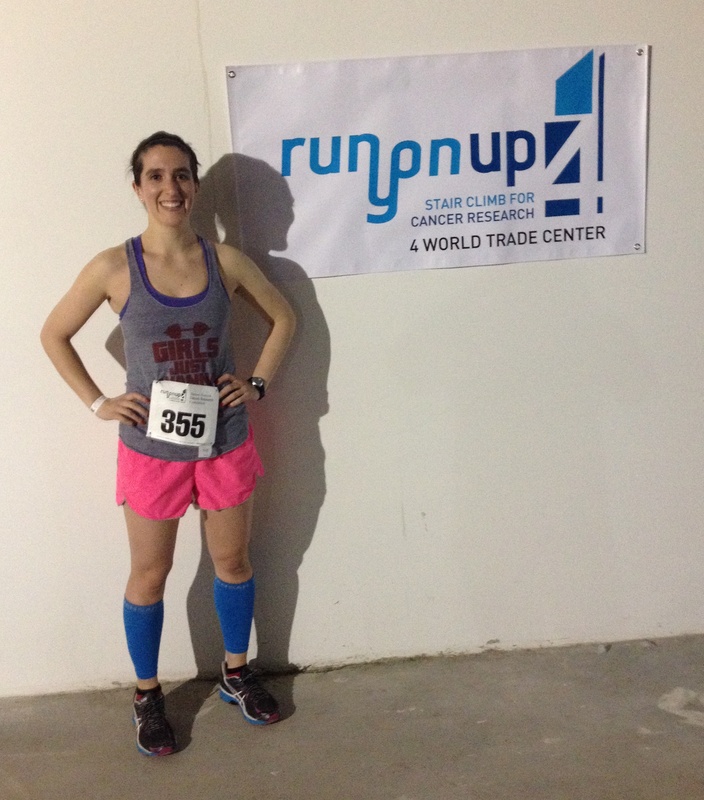 I got my hands on some answers from Michael Karlin, an experienced towerrunner who was also planning to compete at RunyonUp Karlin, a U.S. delegate to the Towerrunning World Council (yes, such a thing exists! ), has been ranked as high as 40th in the world among male towerrunners. He assured me that no one has unlimited access to practice in skyscrapers, and that with a general base of plyometrics, cardio and strength training, I'd be just fine. Still, I knew I could easily fall prey to what he called a towerrunner's biggest mistake: going out too fast. "They get really excited, really revved up, the buzzer goes off and they start running up that building," he told me of people who make this blunder. "You have to pace it. After half of it, if you feel okay, you can push it a little faster." With his words ringing in my ears, I crossed the start line at a slow jog that took me to the 26th floor in what felt like no time. Two thoughts immediately came to mind when I saw that 26 on the wall. The first was, "Wow, I can't believe I'm already more than a third of the way!" That was followed immediately by, "Holy cow, I'm only a third of the way!" My slow start hadn't been quite slow enough. After the 26th floor, I probably ran about every third floor and sort of marched the others. I took water whenever it was offered -- aid stations were about every 10 floors -- and I climbed at a slower pace while I sipped. As if climbing 72 floors wasn't taxing enough, the dry, dusty indoor air caused a scratchy dryness in my throat that made me remember (fondly and less so) my high school indoor track meets. My calves and quads started to burn around floor 30 and then melt around floor 50. A couple of times my feet didn't find the next step as cleanly as they had in the beginning. I got into a nice rhythm, using the railing to my advantage (another pro tip from Karlin! ), and found myself passing people as I neared the top. A friendly competitor called out, "Keep jogging, girl, almost there!" as we rounded a corner in the high 60s. I crossed the finish line smiling. What It Helps With: You don't have to climb to the top of a skyscraper to reap the benefits of a workout on the stairs. Even just walking up more steps every day can bring noticeable improvements in physical fitness. Stair workouts also challenge all the leg muscles (surprise, surprise), while being easier on the joints than pounding the pavement, according to Greatist. What Fitness Level Is Required: Despite the name towerrunning, the majority of competitors I saw at RunyonUp were walking, and people of all shapes, sizes and fitness levels participated. All you need is the will to keep putting one foot in front of the other. That said, to be competitive in towerrunning is a whole different ballgame. It goes without saying you'll likely need to be extremely fit to finish at the front of the pack. It may even require a slightly different set of athletic skills: Karlin says he's not the frontrunner in normal road races, but he seems to naturally excel on the stairs. What It Costs: Entry fees vary by race. Running stairs in your office or apartment building or at a local stadium, however, is totally free! Would We Do It Again: Going into this, I figured I'd be able to say I did it, and I'd want nothing more to do with stairs. Call me crazy, but I really enjoyed this race. Maybe it was seeing the number of floors tick by so quickly -- there was always measurable progress -- or maybe it was just the spectacular rush seeing this view from the top, but I just might try another.